After the elation of yesterday's first hatched brood of the year, today the down side. My worries of yesterday were well founded when I was told by Some Trust members that they saw a group of Ducklings going into the Harbour yesterday afternoon. Today I tried to find them and doubted that any would have survived the night without a mother. Currently there are two high spring tides a day which means the tiny ducklings would be unable to get out of the water for many hours. Being only a day or two old the cold water would kill them unless kept warm by mother or huddled in a group. Incredibly, I spotted 2 ducklings between the boats searching for food - they had survived the night. Sadly the other 9 must have perished, probably at the hands of Crows and Gulls. The Trust is committed to intervene in the case of Orphaned or injured ducklings, with this in mind I mounted a rescue operation, and after 2 hours managed to catch the ducklings. They are now being cared for in the Trust brooder. I will attempt to introduce them into disco's brood - due to hatch in a weeks time. With a bit of luck they will have a Mum to rear them until fledged. Short clip below, preening close to a mother duck after a hearty meal ! Good Friday and Easter traditionally a time for new life. This indeed is a Good Friday, being the warmest day of the year so far in this part of the world. Coincidentally we also have the appearance of the first duckling brood of the year ! No sign of the Mother duck which is a bit worrying, but hopefully she will turn up soon. Often new mothers get pounced on by single drakes and briefly have to make a quick exit from the river. The hatch timing is critical, and their survival depends very much on the mothers care and the weather. The warmth today should ensure a hatch of insect life too. The Town Herring gulls are under siege, from their own kind as well. My neighbours adjoining flat roof has been home to a pair of Herring gulls for many years. They have in fact raised many chicks in the 16 years I have lived here. I must have put their fallen chicks back up onto that roof umpteen times over the years. Currently they have a Turf war on their hands from another pair that seem determined to take over their patch. There was a vicious fight today between the two males and the standoff continues ! There is valid reason why some people complain about the damage they can do to property, witness the flashing having been torn away from the brick wall in this instance ! It is often said nature can be cruel, today a savage reminder on the river of just how deadly this can be. Penny is currently sitting on the nest, and Duke on guard nearby watching for any threat to their territory. Sadly a rare visitor in the shape of a Whooper Swan, made a fatal mistake of flying into the river at this time. It was immediately pounced on by Duke and relentlessly attacked for more than 10 minutes. It could not escape as Duke was too powerful and on it's back the whole time, holding it's head under water. As I was too far away for any close up shots, I was told by a witness that the Whooper died shortly after from exhaustion and drowning. This is very sad, and witnessed by several distressed onlookers. We often see it on TV as the natural world in action, a reminder that life and death are never far away, even in the seemingly tranquil world of graceful swans. However sad, Duke was doing what male Swans do - protecting his domain and nesting mate. The Photo at the top is from two years ago when Duke overpowered another Mute Swan, this did not result in a fatality and Duke let him go as they were on dry land. Fights between Mute Swans rarely end in fatalities as one or other usually backs off. In this case, the fact that it was a different species may have made the difference between life and death. As always I'm full of wonder and admiration when it comes to birds and their egg producing abilities. An evolutionary miracle from a time even before the Dinosaurs. The Mallard duck is one of the most successful and prolific waterbird species on the Planet, and watching Disco having just laid 17 eggs I'm not surprised ! They contain all the DNA ingredients for new life and never cease to amaze me. The incubation by the parent in itself is amazing maintaining a temperature of 99 F for a month, regardless of the changing weather conditions around them. Having 4 of Disco's eggs in the incubator I have to copy to some extent what Disco does to successfully hatch her brood. After 6 days I'm able to candle the eggs and check if they are indeed alive and viable. 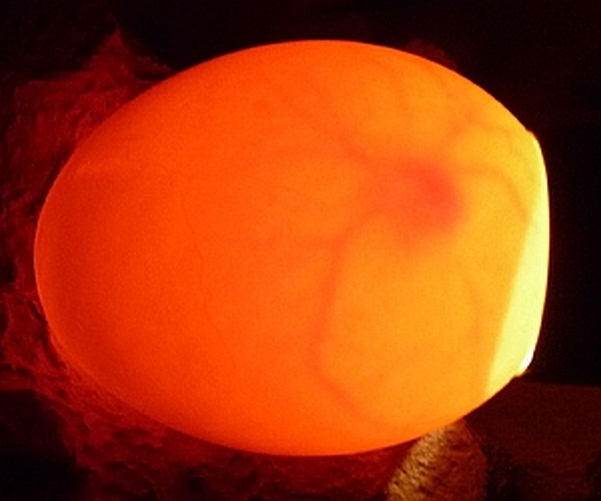 The photo above shows what can be observed by candling, showing the embryo and blood vessels forming. From the 9th to the 25th day, I have to allow the eggs to cool down once a day for about 15 minutes, giving them a fine mist spray before closing the incubator back to the 99 F. This is emulating exactly what the mother duck does when leaving the nest to eat and wash once a day while nesting in the wild. The eggs also have to be turned in order to prevent them sticking to the inside of the shell and dying. The final 3 days requires no more turning, a slight drop in temperature and raised humidity. So next time you see a mother duck with a large brood of ducklings in tow, just think what a feat she has achieved ! Nesting season has started once more. Penny has begun nesting for the 12th year on the Island, she is now a very experienced mature Swan of at least 17 years. was hard going, but soon Penny will confine herself to around her Island home for the incubation period. On the home front, Disco has also begun incubation today, having laid 16 eggs four of which I had to put in the incubator. These will be reunited with Disco and siblings when hatched. Looks like a busy season ahead. Our disabled duck Disco must have come from a long line of bakers, as she has 13 eggs in her nest today ! The preferential treatment goes down well, and she is in danger of laying too many to hatch them all. Provision of adequate good food and conditions, suits her down to the ground...or should I say pond ! Blustery start to the Spring season sees Penny and Duke getting into the mood. Penny very much encouraging Duke with head dipping and side preening. This months high spring tide always seems to trigger Penny into a broody condition, and is the precursor to mating and nesting. Ritual mirroring of each others movements will be a regular occurrence during the coming weeks. On a sad note, I had to have Limpy the disabled Drake put to sleep yesterday. His quality of life was poor and he was struggling to get around. He survived nearly 2 years and was good company for Disco, I'll miss him. As I have remarked in the past, I am truly astonished by the Natural World and keep getting reminders of how great it is. Today is the International day of Happiness, and I reflect on what gives me happiness. Keeping life simple, rejection of consumerism, connecting, observing, appreciating and love of the Natural world - my keys to happiness ! Today is also the Spring Equinox where we have equal daylight and darkness, this changes by several minutes a day as we head towards Summer time. It is no accident that Penny has decided that it's nearly time to start nesting again and today checked out her Island nest site. They may not have clocks or computers but the birds can tell the time with amazing accuracy. A reminder again that this Planet was theirs long before we arrived. This weeks High spring tide gave me the opportunity to dislodge a heavy tree stuck at the Merryton bridge, one less obstacle to cause a problem. As expected, Disco the disabled duck has started nesting. Last Tuesday I saw that she was preparing the nest, and by Thursday she had started laying. This is pretty well in line with last year to the day. Today she has 3 eggs and I expect she will continue to lay daily until the full clutch is complete. Being unable to access the river minerals, I have been giving her Calcium in the form of Cuttlefish shells which she loves. She and her new mate are getting on famously, and all the signs are that many of the river ducks have also started nesting. I hope that any plans for litter picking on the lower riverside are completed by the end of March - to avoid disturbing the nesting birds ! Penny and Duke have been feasting and resting prior to annual nesting time. The last spring tide during March is usually the start of Penny's nest building season. Meanwhile they are inseparable, looking great and enjoying the freedom of the territory. Short movie clip below showing Penny drifting off to sleep, giving me a reassuring snort of total trust, a real privilege for me. Note, the eyelids close from the bottom upwards. Wild weather today, with cold gale force northerly winds and river in spate. Seemed inevitable after February's good weather, that a return to winter was certain in this part of the world. However there are signs of spring, with new grass, shrubs and trees budding, and Disco and her new mate happily doing what comes naturally on a daily basis in the garden pond. Still no egg laying but am sure it wont be too long before making the nest. Meanwhile I take Limpy her disabled friend indoors from time to time for an exclusive bath. Short clip below.